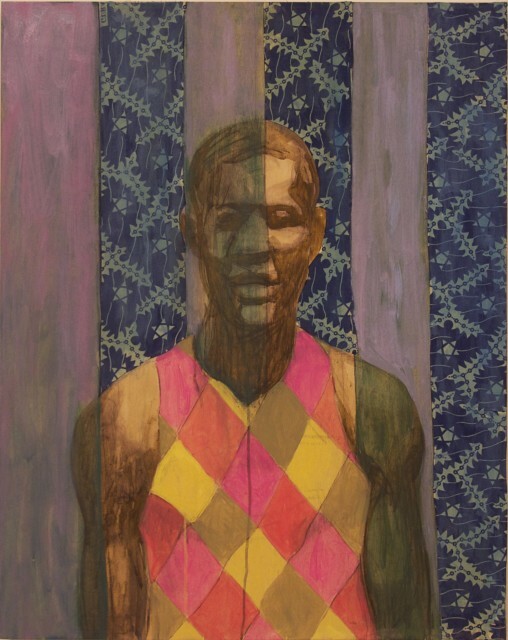 Jack Bell Gallery is pleased to present a solo show of work by New York based contemporary artist Derek Fordjour. In this new series of paintings the artist creates portraits using layers of oil, acrylic, newspaper and fabric on wood. ‘Meritocracy’ will be his first exhibition in the UK. Fordjour draws on a variety of sources from American popular culture, including professional sports, board games, carnival and circus artifacts. His images explore the allure, economics, politics and psychosocial implications of games. ‘My primary interest is the vulnerability of the player within the game context’, he says, ‘and more broadly how it relates to the human experience’. Fordjour questions notions of rewards and sanctions, merit and demerit, outcomes, potential and power. His subjects and the spectacle of sport are used to convey various forms of wider social critique. Familiar imagery, objects and motifs are combined and reconfigured to investigate underlying issues surrounding gender, race and class. The artist offers narratives that are both personal and universal, melancholy at times and often left unresolved.